The results are in! As promised, the many comments below were placed individually in a big, empty tub of Lego and the three winners were chosen at random! Roy reached his little hand in first and selected…Tatyana in the United States! Next up was Lulu and she chose…Stephen in Brazil! Finally, my own hairy paw clawed through the entries and found…Mandy, also in the U.S.! Congratulations to the winners—I’ll contact you directly to award your prizes. And to those who weren’t in the winner’s circle this time, please know that I’m very grateful for all the feedback that was offered through this giveaway. I value your thoughts and I do hope that I can gradually incorporate many of your good suggestions into my work. Thank you for your interest, and your support! I’m happy to report that the performance issues this site has been suffering lately have been resolved. (Sorry if you found it hard to access over the past few weeks!) The frequent downtime, and slow-loading pages, were a large frustration for me, and I concluded that I needed a fresh start with a more stable server. Since I made this move to a new server, other possibilities to improve Bilingual Monkeys, and make it more helpful for others, have been on my mind. Looking ahead to 2014, I would love your feedback. Every person who offers feedback will be eligible to win a $20 amazon gift card in a drawing held on December 3rd! There will be 3 lucky winners! 4. All entries must be submitted by the morning of December 3rd (Japan time), when I wake up and sleepily turn on my computer. (Please proofread your comment, before submission, to make sure that the information is complete.) That day the entries will be printed out, the slips placed in a big, empty tub of Lego, and the winners selected at random. Roy will choose the first winner; Lulu will choose the second winner; and I will choose the third winner. Each winner will receive a $20 gift card from amazon. 5. The winners will be notified that day by email, and this post will be updated with the results. Even if you don’t win a prize, you’ll be giving back to Bilingual Monkeys through your feedback, and helping to make my work of greater value for all. Although I won’t make replies here—I’d like this to just be a forum for feedback—please know that I’m very grateful for your comments and I will consider all your thoughts carefully as I move forward with my work to support parents and children on the bilingual journey. UPDATE: Based on the useful feedback that I’m receiving, I’ve already begun to experiment with certain changes to this site! And the follow-up post: Remember Those Surprise Packages from Japan? 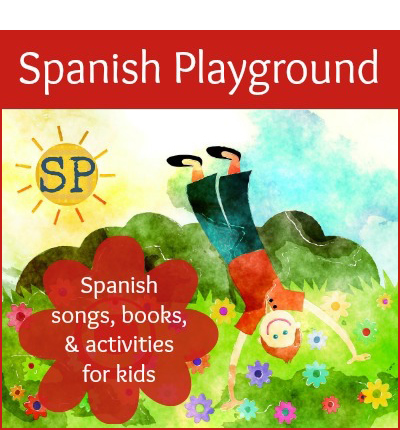 Christmas Giveaway at Bilingual Monkeys! 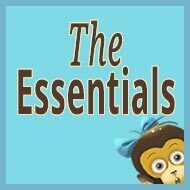 Bilingual Monkeys was one of the first sites I came across when I started researching how to bring up my son to be bilingual. Your enthusiasm and practical ideas have proven to be invaluable and I cannot thank you enough. You have inspired me and my family to be bilingual and motivated me to start my own blog. There isn’t much you could do to improve on this site. One thing you might want to think about is to have stories from other bilingual and multilingual people around the world, perhaps those who don’t have their own blogs and so don’t have a voice. Maybe you could also have a FAQ page for people who are new to this whole bilingual thing. I love the website. I love that your kids are not seen, so we don’t feel bad about invading their lives. Since my kids are a little older, I feel like a lot of what you write about I already know or have experienced, but I appreciate and admire how you organize your thoughts and get it out to everyone. We keep reading material of all types in the bathroom which really does help. I used to write more notes for my son (the oldest), but by reading your blog, it reminds of things that I often take for granted or have stopped doing more due to general busyness than anything else. It is a good reminder. Things you might be able to do better. I have some trouble getting around the website if I am looking for something specific. At this moment, I don’t know if I am only commenting on this comment or if I am actually writing out my feedback for the lottery. I am always up for a raffle! Surprisingly I missed the other raffles and contests. Sometimes I read the posts late, but I am still surprised that I didn’t notice them. I like the idea about bilingual people writing in and telling their stories, or writing in about some habit or experience that helped them become bilingual. 4. A. The ‘bilingual monkeys’ helped me be more firm about my decisions and also to get rid of the frustration I was feeling while talking Romanian outside our house. B. But the best part is that it increased the quality of time I spend with my son. We have much more fun and the whole family is happier. Thank you, Adam! C. Yesterday, he was so proud that was able to talk to a girl through Skype in Romanian. He began to feel the importance of the second language already. D. The minority language brought me back to my own childhood and is wonderful to read again the old stories and poems. 5. A. I would like to find more practical information about the age of 2 and 3 years old. Maybe a categorization by age would help: things we do and discover at 2-3 years old, 4-5 etc. Your stories about Roy and Lulu are great and some practical tips can help me, but there is a big divergence in age (i.e. my son does not read and write yet). Maybe you have records or could remember some of your experiences regarding 2-3 years old and write some posts about them. I would be very grateful for that. B. Sometimes I want to find an article I read some time ago and it’s difficult. A search engine would help, using key words. C. Design. It would be better for me to have the “new comments” part somewhere up, not down, where I might never see it. In this way the interaction between people may increase. Also, I would move the category “New here” at the menu bar, which should be more visible. 2. 2 girls, ages 4 and 1.
a) It definitely provides me with a sense of motivation. There are days where I wonder why I even bother. Even the bilinguals I know are more lackadaisical about the whole language thing. This blog reminds me that my obsessive focus on passing on my language is a good thing. b) Sense of community. I only really know one other family with kids who are actually bilingual. It’s nice to see others like me and to feel not so alone. c) This is completely strange, but I totally used this blog to find a good book to gift my monolingual nephew. The reviews of the books and games are awesome. They’re not applicable for me for minority language development with a few exceptions, but they’re really good for just finding fun stuff for the kids. d) I’m a bookworm. I think reading and enjoying books is a habit that is very important for children. 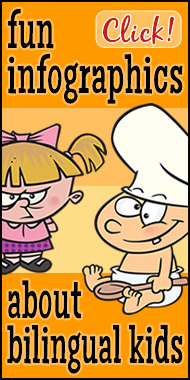 This blog is the only parenting related blog that shares that value with me. e) The ideas here are sometimes completely off the wall. I’m used to the usual call parents/Skype/read books/visit the country advice, but here I find stuff I never even thought of like a whiteboard in the bathroom or accusing my child of things she didn’t do. I totally was skeptical of that last one, but the other weekend I accused my 4 year old of pooping in her sister’s diaper. Older kids like sneaking, little kids like potty humor. She LOVED it. There was a long and lively debate on who possibly could’ve come over, undone the baby’s diaper and then defecated in there and put it back on. We settled on the dog that must’ve been desperate to go potty but nobody let him out. 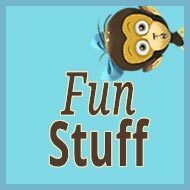 Advice on language development and fun activities with kids all on the same blog, what could be better? f) I really like the monkeys. I know it’s weird and not important in a blog, but they’re so cute. I totally imagine you all as monkeys, especially Lulu who makes the most frequent monkey appearance. g) I like the balance of seeing into your home with the privacy you maintain for your family. There too we share similar values. I don’t want to know your street address, or real names of the children, but I love hearing about the hijinks your family is up to. h) The twice a week regular frequency is perfect. I keep coming back every Tuesday and Friday because I know there will be new stuff. So this blog is never forgotten. With other blogs the postings are rare and not regular so I eventually forget about them after visiting a few random times with no updates. a) I’m of two minds about sharing this blog on other media like Facebook. It splits the conversation. There are some comments here, some comments there, it’s confusing to track and until I found the Facebook one I missed on a bunch of conversation. b) I come here for the comments as well as the main article. So it’d be nice if on the front page there was a comment counter or something that would let me quickly see if there are any new comments since the last time I visited. c) As indicated on previous comments I too would like to hear from others, including their variations on the ideas you introduce, as well as hearing more about children the age of mine. I know one blog does interviews with other families. I think you should take a different approach on this – guest writers. It’s a win, win, win, win? There are more stories and ideas. There is a wider age range. It allows you a break for those days when you’re struggling to come up with a regularly scheduled post. It allows people like me a voice. I thought about doing a blog, but in reality I have maybe 3 posts total in me which does not a blog make. I could never do what you’re doing but at the same time I sometimes wish I had a forum to share my ideas. d) More reviews of materials. Books, magazines, games. I think it probably needs to be a section up top. Maybe even have others do reviews so you can include more languages. e) If you think there are enough readers, maybe a message board? The blog is great as is, this is more just as ideas for expansion. f) Better search features. I had a heck of a time finding that article you did on books. I knew it was there, but it just took a long time to actually find it. g) Can do week/month long challenges. You did one once where you asked readers to do something they were putting off and then report back. Just make it more specific, like accuse your child of something they didn’t do this week and report back with the silly conversation that followed. Admittedly I was tempted to copy past the old testament in order to pad out my post since really there is little that I would change with your fabulous site. Sadly my mother made me a rule follower and instilled a great sense of fairness, which continually gets in my way, so I’ll play by the rules. Feedback: Ultimately, content is king and you are most definitely sporting a jeweled crown. It’s why I keep coming back for more. Of course the monkeys are cute too. If I were holding the scepter, there are two things I would allow myself to change. 2. Less clutter on the main page. For a pretty busy site, you actually have a really nice clean layout. But for me anyway, in this world where we are bombarded with information, banners and buttons left right and center, the less stuff I have distracting my eyes the better. 1. Recent comments. Unless I am actually reading the relevant post, I am not interested in the comments. 2. Torn about ‘New Here’ – Kind of think it could be a tab of its own instead of on the side bar. Or perhaps just another cool button which links through to a page with all the relevant posts. 3. Archives I would just lose. 4. Categories, I would have right at the top. This is a great place to immediately spot what things you are writing about. 5. Recent posts. – again It just isn’t necessary. And especially since you have all those wicked nice designed buttons with stuff. If people want to see recent posts, they will scroll. 6. Popular posts would be the one I would keep. And without endless lists of red, I think it would draw more attention. Of course, with all that said, you do the most important thing right and that is the content. Oh and you have like a quazillion followers and I don’t so maybe disregarding everything I say isn’t a bad option. Now I must go pick some pennies and pray for a voucher. Books are so damn expensive in Asia! 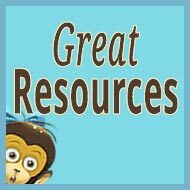 How has Bilingual Monkeys been helpful to you so far? It gives me motivation in those rare moments of doubt. Also, from time to time, I recommend some of the posts to those of my friends and relatives that do not completely believe in ‘this whole two languages bringing up’. Two of those disbelievers have changed their minds after the lecture of your (and others’) posts. How could I make the site, and newsletter, even more helpful to you? I’m in a constant need of books, magazines, games (both computer and board ones) etc. and so, to be honest, this is the main reason I read bilingualism related blogs/websites. This could be a separate, much bigger and more taken care of section (category) brought to the front of your blog. 4. The site and especially the newsletter is simply a great reminder to invest in the various languages on a regular basis. Sometimes when things get stressful around home I tend to slow down my efforts. Usually your next newsletter gets and blog entries get me going again. Thanks! 5. I think everything I was thinking of was already mentioned above. So I leave it at that. Great site. Thanks!!! 4. 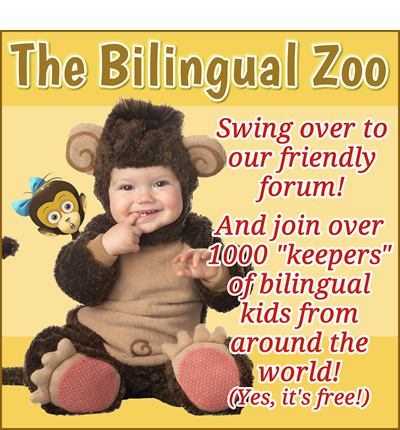 How has Bilingual Monkeys been helpful to you so far? 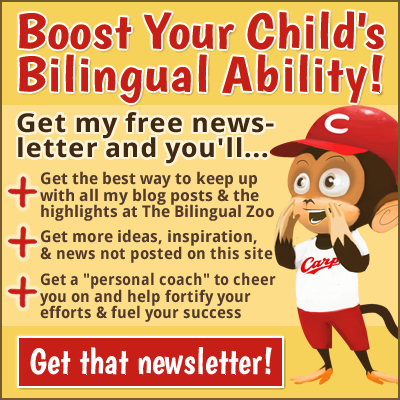 The true value of Bilingual Monkeys for me is that it serves as a role model – confirming that living in a bilingual environment is completely possible and …. ultimately infinitely rewarding. 5. How could I make the site, and newsletter, even more helpful to you? I’d love more contests like this one! 4. Anyone who tries to have a bilingual household knows that motivation is the key. 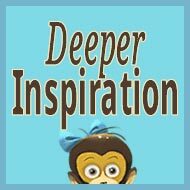 The Bilingual Monkeys site and newsletter serves to do exactly that, give us motivation when we need it most. 5. I have found that my children are becoming less and less interested in English language books. I would like a list of great, interesting books that can draw the child into more interest in the minority language. 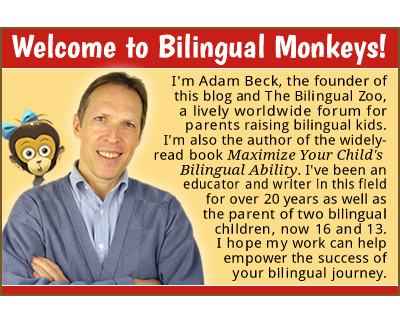 Bilingual Monkeys has been useful to me as a regular reminder to stick with my program. It’s so easy to put off practicing reading and writing with my little monkeys – always tons of other thing to do or get distracted by. I’m busy, my kids are busy, but we’re never so busy that we can’t spare at least 5 or 10 minutes each evening for reading time. If we do skip our reading time for one reason or another, Bilingual Monkeys helps me feel guilty and get back on track. I started writing morning notes to each of my children a few months back. I’d like to see examples of notes other people write, to help inspire me to to write more creatively, and keep it fresh. 4) I always enjoy the posts, even if they do not relate directly to my family’s situation since my kids are older. The tone is upbeat and humorous but very genuine, which makes it easy for other parents to relate. We are not being told ‘this is how WE do it’ but are rather being invited to consider ideas and then share our own. Very much a two-way thing. 5) Hmm, apart from wishing I’d had this site about 10 years ago when I was struggling in the trenches with three small bilingual kids, I would love to see more input from parents of teens and tweens. I’m finding it hard going to get my 12 year old interested in reading books outside of those required for her English class in Japanese junior high. She’s in a native speaker level class with mostly returnee kids. 4. I enjoy the newsletter because it keeps me alert of new posts. I think the quantity you post is perfect. I blog myself and wish I was more consistent. 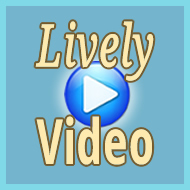 I know the readers appreciate this – knowing we can come to your site on a specific day and see something new. I also like the graphics (the monkeys are fun). I enjoy the anecdotes you share of situations you have encountered living in Japan. These bring to life the differences between our cultures. I also enjoy the unique and clever ways that you encourage your children to use their new language. 5. As neither my husband or I speak the language my children are learning, many of the ideas you share – though I love them – are not really applicable in our house. For example, as much as I would want to, I would have no way of carrying on a dialogue with my kids if I were to blame one for something they didn’t do. We do not live where Mandarin is spoken. I therefore would love to see more ideas on how I could encourage my kids to use their 2nd language with one another – to build their conversational skills. They are learning a lot of vocabulary with their tutor but I lack ideas for giving them opportunities to put it to use daily; games, activities, etc. On a side note, a simple search widget would be helpful (whereas the archives widget is not). Mother of Gabriel, 3 and Manuel, 6 (both boys). Our ML is Italian, ml English. I am just in love with Bilingual Monkeys because it has introduced me into a world where I am not alone in this attempt to raise my children bilingual. There are other sites about bilingualism but none of the ones I’ve found are so practical and focused on the “every-day-life-kind-of-issues”. Bilingual Monkeys is my source for activities, little tricks, strategies and inspiration, in one word it is my bilingualism bible! Please Adam, do not ever let the computer problems (by the way: I have never noticed any malfunction) stop you! We need you! The only suggestions I can give you is to create a way for us bilingual parents to get to know each other, maybe a forum, a message board or something like that. I do not even know if there are other native Italians living in my city who are experiencing bilingualism with their kids and being my kids’ only “English source” I would love to meet other families with babies and maybe create a playgroup for our kids. I guess that’s all from me…now I just need to keep my finger crossed: last giveaway contest I was so upset I did not win the book that I almost cried. Here in Naples I do not only have to fight with stupid people (teachers included) who still think if you speak another language to your kids they will “get confused” and not talk their main language properly, but also have to struggle with a wide lack of resources, including English books (unless you have lots of money and can afford to buy them at the big book-shops chains). 4. I am encouraged to keep on keepin’ on! I remember to use the minority language with my children regularly. I need the reminders! 5. I need more lay language arguments for raising bilingual children. In my job I speak academic-ese and that does not resonate with many family members or academics from other fields. What are the REAL reasons for raising multilingual children in REAL language? Thank you for the weekly encouragement! I’m impressed with your courtesy given the volume of content on your site. You’ve always let me know when there is a response to the piece I did, and been friendly and helpful beyond the call of duty. I sometimes feel guilty about not doing as much for my kids as you do, but then that’s my problem. Keep up the good work. Adam, thank you for your efforts. This site has provided encouragement and support, in general, while also offering a wealth of practical and specific information. In a sense, it feels as if you have done the legwork, and sometimes the “dirty work”, of brainstorming for all of us who avail ourselves of it. At the same time, I really appreciate the fact that you remain solidly non-judgmental, obviously aware that there are multiple goals and multiple paths. That attitude is particularly welcome when it comes to issues of bilingualism, as there are so many people who seem to have extremely strong and firm attachments to particular paths. Most obviously, there are a number of people who would liken anything less than an unwavering and uncompromising commitment to “second” language fluency to child abuse. Thank you for understanding the nuanced reality (or realities, more accurately). Honestly, I cannot think of how to make this newsletter any better than it already is (and no, that was NOT meant to be “apple-polishing”, though it may sound like the result of being in Japan too long!). Thanks again for all your hard work and encouragement! Hello! Here’s Kiara from Italy! My babies are Viola, 3 and Matteo, 20 months. When I discovered this website I was plenty of joy. My inside “voice” was packing my back and telling me…see, you are doing great!! Go go go!! And then I started reading all the posts and newsletters, and they made me laugh and even cry; they inspired me every day to continue my efforts and never give up. I read aloud even some funny posts to my kids…and I bought the amazing tales…and I’m looking forward to read more and more and never be annoyed…and share with all my multilingual friends. Thanks a lot and hope I will give my own little help to you. I think the website is improving. Maybe if you want one of my artist-painter best friend can draw some illustrations in the tales that you sell, just to gain the attention of little kids easily. And maybe when you comment a post have a feedback on the email when someone comments back or replies. I’m not a teacher/writer like Adam so I think I can just learn from him/you. The strength of this site is the knowledge that people share here, too. 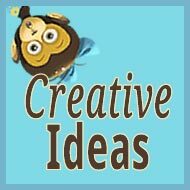 Your site is wonderful and has given be lots of extra ideas to try with my kids. It also motivates me after a long day coming home tired. I make sure we read, play and talk in English. Thank you for the wonderful ideas and for sharing. How to make it better, people who have already commented have left some sound ideas. My main worry for now is teaching my kids how to read English. 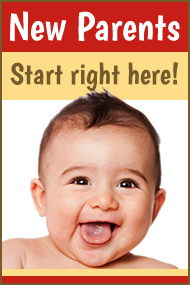 My son can recognize and write most of the alphabet, but how to get him to read words. I have of course read about it but I really think I would like an easy guide to teach my kids to read. So maybe my suggestion is articles linked to teaching kids to read. Or a place where people can leave what they did to teach their kids. As well as useful resources to do this. Please keep up the great work and thank you so much. Your site makes me feel like I belong to a bigger movement. I do have lots of friends with small kids and we are all bringing them up bilingually (mostly for family reasons), but it wasn’t till I found your website that I learn about all the different techniques. At the beginning we were just doing what felt right, but now we can see if somebody else used a particular method in the past and did it work. I don’t need to re-invent the wheel any longer… uffff And all the tips are just great! 4. I discovered Bilingual Monkeys in the right moment. My 5 year old son is speaking Spanish very well (my mother tongue, our minority language since we live in Germany and my husband is German) and I was kind of relaxing about the Spanish input. Reading your blog gave me the push that I needed to get back to track. I like your ideas, you are very creative when getting the minority language in with fun. I also liked a lot your post about reading aloud resources. And I am putting on the Christmas present list some games to further develop the Spanish knowledge. I also liked a lot your view on talking the minority language outside home. Sometime it is hard and I felt “unpolite” to those not understanding, reading your view confirmed my thought that I was doing it right if I want my children to learn my language. 5. I don’t have any improvement proposals so far, there is still many post that I have not read and want to. 4. I find this website a precious source of ideas! I surf the web a lot, and I am familiar with many websites focusing on bilingualism and multilingualism, but I confess that on this one I find often very very original ideas, because these are your own ideas. I mean, other websites give information that are maybe more based on literature and research than on personal issues and experience. I can see on this page that a whole lot of people follow you, from literally all over the world!!! It really makes me feel I am part of a community! And how do YOU feel, when you think of all the bathroom walls around the world stuffed with stories and fairy tales, after the way you described on your website??? I think it really should give you some satisfaction!!! We are a family where both mum and dad are Italian, with no natural multilingualism, so our experience of bilingualism is totally artificial, but it comes from a strong desire on my part that my kids grow multilingual. I say “on my part” because … my husband just gives his assent 😉 and does not help much. I think when the familiar situation is like yours, with two mother languages, it is natural and “easy” to decide to grow bilingual children, but in my case it is not, and I can tell you in Italy this situation is pretty common, as I discovered from other websites. Yet, even though it is common, people around us think we are almost crazy and think growing a bilingual child when there is no need to do it is like uselessly complicating oneself’s life! 5. I think you should include ideas and resources for families where the minority language is non native: in these families bilingualism is not to be taken for granted. There is just a strong will to introduce a new language although that is not the language of the parents, nor of the country: I think in such cases families require more motivation and more passion than do the families where bilingualism is aimed to preserve family traditions, to secure a mean of communications with grandparents, etc. I think you have ascertained by now that I am a non native English speaker! 😉 Sorry for the mistakes!!! I hope I made it clear to you in what way you could make your website more rich and more useful for ALL kinds of families because, I repeat, families like mine are very very many! Bilingual Monkeys has been a great inspiration to keep going with my efforts and that it is all worth it. I have found it difficult at times to keep going in this bilingual quest and alone in my efforts. It can be very difficult to keep motivated especially as my eldest is getting older and the majority language seems to become more and more important while his accent and vocabulary slowly deteriorate in French. I have used some of your ideas already and shared them too even though the boys are so young. I have started a French group in England for other parents who are trying to raise their children bilingual and this has been a great success with us meeting every week to play/do activities/sing and read stories. Your ideas can be applied to any language which is what I love and I also like the humour and references to animals as I am an animal addict too. I also like the little snippets of parental advice that are always respectful of your children n gentle. We made the decision to send our eldest to a French Saturday school even though it will cost us as I realised how important keeping him fluent in French was to me and what I needed to do to keep it going as he grows. I am looking forward to using more of your ideas as he grows and like how involved your parents are in this journey too. My only input is that a lot of your ideas are for children of reading age rather than smaller children such as a toddler or preschooler. With my second son being born now and my first using English to play with I am aware that my second son will hear more English than my first and his French is likely to suffer; so this is a crucial time for me to dig deep n keep trying while they are little. This is probably a time where a lot of people give up, when children start preschool and school and start to answer back in the majority language. How do you keep them motivated to use the minority language? 4. Great ideas that help keep me (and the kids) motivated. The comments from other readers are also interesting and informative, so the site is a great way to get a wider take on things. The honesty and determination of you and your readers makes me think, and be more honest with myself about how much effort I am (or am not) putting into keeping my kids bilingual. I love the quotes, too. Thanks for starting this site, and for keeping it up through all your busyness, technical trouble etc. 5. Someone above mentioned how the facebook conversations and the main site ones are different. It would be great if they were more synched, but I guess that is pretty hard technically. Also, I was wondering if you would have space on your site for sharing information about Minority language schools. We started a small “Saturday school” here in Hakodate, after I read a book about some families in Honshu that did the same. It would be nice to have a kind of forum where we could see how other people and communities around Japan and the world run such classes or schools. 4. I found Bilingual Monkeys at the time my kids started to read in Dutch. I was full of doubts whether my dream that they will also be able to read and write in Spanish could be possible. In Bilingual Monkeys I have found practical and fun ideas for the next step in our bilingualism. I mostly like that you are honest and you share what works but also share with us where you are finding the biggest challenges. It inspires me to keep on going ahead. 5. Many of my suggestions have been already commented above and although it would be good for my chances of winning 😉 I will not copy-paste them. I agree a forum would be nice but I can fully understand that for you it would be right away a big project. Maybe to start you could publish experiences from different families that they would mail you or ideas. For example, you could launch a question and people could answer it per e-mail and you could gather their answers in an article (for example, do you keep the language alive or also your traditions? how do you do it?). Further I would love to read more about experiences with older kids as well as younger ones. And for the rest, keep on going. I love it. 4. I think your website is great! I would second every comment made above. 5. I realize I’m slow on the uptake and didn’t make it for the draw, but on my bike ride to work this morning I had a couple of thoughts for things you could add to the site. -Guest blogs. I definitely echo other parents’ sentiment about this. You could run a contest for submissions and then pick the top ten for inclusion in the Bilingual Monkeys line-up. Or, you could contact parents directly who have left comments on your blog whom you think might have some good insights. I, for one, am not a blogger but might be convinced to write one guest blog for fostering minority language use in the 1-3 year old range (so far I’m really pleased with my daughter’s use of French and we’ve tried some things that I haven’t seen on BM yet). -A community message board. Reading some of the other parents’ comments, I realized that it might be a great way to redistribute books in minority languages. Although I’m not ready to part with any of my daughter’s books quite yet, I can imagine a time when some of her English books (which are plentiful and easy to come by here) might be useful to other parents that can’t find English books easily.